Daddy won’t you take me to the Primary Forest by the Amazon River where Paradise lies. Honoring his end of life wishes, ethnobotanist Jim Duke’s ashes were scattered not only in his Green Farmacy Garden but also into the lush diverse forest of the Amazon River basin. Jim’s dear friend and rainforest companion, Andrea Ottesen, PhD, along with Explorama’s garden curator and shaman, Guillermo, mixed his ashes with Peruvian earth as they planted sacred Jergon Sasha (Draconitum loretense) in Jim’s ReNuPeru Garden. Above the treetops on a perfect sunset evening, Jim was blessed during a traditional ceremony performed by Guillermo. Guillermo was adorned with a shapaja palm (Attalea sp.) headdress as he chanted from the highest platform of the ACTS canopy walkway. In and around an enormous Ceiba or Kapok (Ceiba pentandra), Jim’s ashes mixed with jungle spirits. Several of us escorted Jim’s ashes to the rainforest. His daughter, Celia Larsen, who had accompanied her father to the jungle approximately 25 years ago, made the journey from Michigan. Andrea Ottesen helped organize the trip with Explorama staff and came with her FDA colleagues and University of Maryland students. My family, including my husband, son and daughter, met up with the rest of the group and all of us were facilitated by Basilio, an expert guide and veteran of Explorama as well as musician par excellence. Basilio had worked with Jim for decades to help assist with his “Pharmacy from the Rainforest” tours. Jim was at peace knowing his ashes were to be spread in the garden and the rainforest. The song, Te Quiero, in this video is to be credited to Basilio and accompanying Caobas musicians from their CD entitled Misterio Verde. Caobas musicians serenade many who travel to Explorama lodges and the Peruvian guitarists highlighted the evenings for Jim. A version of this article appears in print on Dec. 6, 2018 , on Page A28 of the New York edition with the headline: James Duke, 88, Scholar Of Indigenous Remedies. At the time, he was two years into his job as a botanist for the Department of Agriculture and working on a federal project, ultimately abandoned, to determine the feasibility of excavating an alternative to the Panama Canal using low-level nuclear bombs. And what he found there, and ate, excited his imagination and led him to embrace ethnobotany, a then-emerging field that investigates the healing properties of plants that indigenous peoples have used for millenniums. His field work, incorporating botany, natural healing and anthropology, took him to remote corners of the world, often in the company of native guides and even shamans — worlds away from his early professional success as a standup-bass player in country, bluegrass and jazz bands. His peripatetic research made him a widely acknowledged expert at a time, the 1960s, when interest in traditional cultures was on the rise, in tandem with the burgeoning counterculture in Western countries. Dr. Duke was also a pioneer in identifying phytochemicals, the now familiar, often beneficial chemical constituents of foods like antioxidants in oregano and flavonoids in green tea. He poured the results of his work into a 1997 book, “The Green Pharmacy: New Discoveries in Herbal Remedies for Common Diseases and Conditions From the World’s Foremost Authority on Healing Herbs,” as well as into an extensive database he compiled for the Agriculture Department. The book has sold more than 1.5 million copies, according to the publisher, Rodale Press. For all Dr. Duke’s achievements, however, his death, on Dec. 10, 2017, at 88, did not draw widespread attention; it was reported at the time mainly by organizations devoted to botany or nutrition. The New York Times learned of his death recently while seeking to update this obituary, which was written about four months before his death. His daughter, Celia Gayle Duke Larsen, said Dr. Duke died at his home on his six-acre herb farm in Fulton, Md. No specific cause was given. In addition to Ms. Larsen, he is survived by his wife, Peggy-Ann K. Duke; a son, John; four grandchildren; and one step-grandchild. Dr. Duke at a jungle camp in Panama in 1968. What he found there, and ate, led him to embrace ethnobotany, a field that investigates the healing properties of plants that indigenous peoples have used for millenniums. Credit Joseph H. Kirkbride, Jr. In “The Green Pharmacy,” Dr. Duke wrote that the trip to Panama, his second, involved interviewing local people about the wild plants they ate. The aim was to determine how long they might be displaced from their homes and way of life — “six days, six months, six years, six centuries or six millennia,” he wryly wrote — if the local flora were destroyed in building an alternative canal. The local people, Choco and Kuna Indians, knew exactly what was going on, Dr. Duke wrote, and sometimes asked if similar nuclear-based efforts were being used in, say, dredging the Great Lakes. The effort, sponsored by the now-defunct Atomic Energy Commission, sputtered and was allowed to lapse. Dr. Duke stressed that the stories he had heard, whether from indigenous peoples or the doctors and other herbalists cited in the book, often reflected empirical and historical findings about healing plants. He was critical of pharmaceutical companies and the doctors who zealously prescribed their products. Skeptical of the high prices and side effects of modern drugs, he championed plant medicines as a viable alternative. “If you and I go around sucking on licorice root, which can guard against ulcers, that’s not going to make any money” for drug companies, he told Anne Raver, a gardening columnist for The Times, in 1991. Dr. Duke’s authoritative reference book from 1997 has sold more than 1.5 million copies, according to its publisher, Rodale Press. And it will take your warts away! James Alan Duke was born on April 4, 1929, in Eastlake, a suburb of Birmingham, Ala., to Robert Edwin and Martha (Truss) Duke. His love of plants, he wrote, came from his mother, an avid gardener, and from spending time in the woods of rural Alabama with “country cousins” and an elderly neighbor, who introduced him to edible wild plants, like chestnuts and watercress. His parallel love of music began when he was 5 years old: He was selling magazines to help earn money for his family when he encountered bluegrass musicians in a local college dormitory. After the family moved to North Carolina, he learned to play the bass fiddle in high school and began performing with Homer Briarhopper and His Dixie Dudes, a country band he had heard on the radio. At 16, he played on a 78-r.p.m. record that the band cut in Nashville. Dr. Duke attended the University of North Carolina in Chapel Hill, where his bass playing caught the ear of Johnny Satterfield, a big-band leader who taught there. He recruited Jim Duke as a jazz bassist, on the condition that he enroll in the music program. His native love of botany kicked in, though, and from 1952 to 1960 he earned bachelor’s, master’s and doctoral degrees in botany at Chapel Hill. He did postdoctoral work as a professor at Washington University in St. Louis and curatorial work at the Missouri Botanical Gardens there. Botany and music continued to be entwined in his life, however. While working, he would pick up gigs at clubs and perform with jazz, blues and country singers. Dr. Duke’s first work experience in Panama involved identifying plants along the last uncompleted stretch of what would become the Inter-American Highway, reaching from Alaska to Chile. His team collected more than 15,000 specimens in the two and a half years he spent on that trip to Panama. Dr. Duke held various positions at the Agriculture Department. As chief of the Plant Taxonomy Laboratory, he traveled to South America to help the State Department investigate and limit the cultivation of coca, from which cocaine can be extracted. He also visited Vietnam and neighboring Southeastern Asian countries to identify cash crops that might be grown as alternatives to the widely cultivated opium poppy. He got what he called his “dream job” at the department in 1977, as head of the Medicinal Plant Laboratory. In that job he traveled to China, the Middle East and South America to collect specimens for a cancer-screening program being run jointly with the National Cancer Institute. The program, he wrote, analyzed 10 percent of the world’s known plant species for anti-tumor activity. After retiring from the Agriculture Department, Dr. Duke sometimes conducted tours, often barefoot, along the Amazon River in Peru. He’d also give tours of his herb farm, the Green Farmacy Garden, in Fulton, about 18 miles north of Washington. Dr. Duke’s other books include “Handbook of Medicinal Herbs,” an authoritative reference work first published in the late 1980s, and “The Peterson Field Guide to Medicinal Plants and Herbs of Eastern and Central North America,” which he wrote with the herbalist Steven Foster. In 1991, Herbert Pierson, a fellow Cancer Institute toxicologist, told The Times that Dr. Duke’s strength as an expert in herbal remedies was in his own firsthand experimentation, measuring the effects of plants on himself. Indeed, in an interview with Ms. Raver in 1992, Dr. Duke spoke about his enthusiasm for dandelion. He liked the roots pickled in old pickle vinegar, and he had eaten every part of the dandelion, from root to seed. When intern Astrid Stephenson and I arrived at the James A. Duke Green Farmacy Garden in Fulton, Maryland, we found director Helen Lowe Metzman wrapping an enormous rosemary plant with burlap. On that mid-November afternoon, the damp chill portended even harsher weather. She had already dug up all the tropical plants and relocated them, safe and warm, in the nearby greenhouse. We walked on a carpet of bright yellow ginkgo leaves, adding rays of sunny color to the overcast day. We took the fieldtrip to see what might be left of the American ginseng (Panax quinquefolius) plants, as part of research for an upcoming program of the 2020 Smithsonian Folklife Festival. At this point in the season, we saw just a dried tan stalk where bright green leaves and red berries flourished earlier in the fall. Nearby, other plants with similar healing properties have braved the weather better. Helen showed (and let us taste) one called jiaogulan (Gynostemma pentaphyllum) whose still green leaves look like a tiny ground cover version of ginseng. 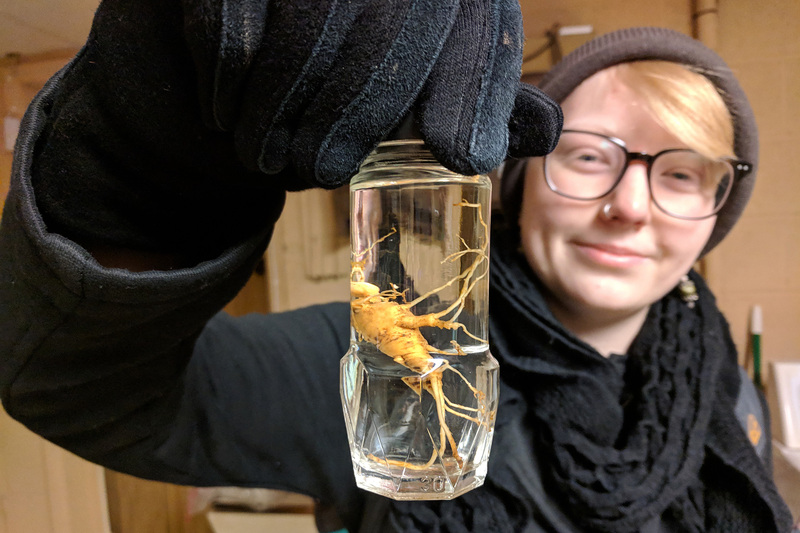 Astrid displays an American Ginseng (Panax quiquefolius)root preserved in alcohol. Ask anyone interested in traditional plant-based medicine if they have heard of Dr. James Duke, and they invariably answer in the affirmative. His most popular book, Green Pharmacy, and other prolific writings grace countless bookshelves of herbal medicine aficionados. He developed the Green Farmacy as a “teaching garden” with 300 native and non-native medicinal plants. He welcomed students and the public to the garden to learn about these plants and their healing powers. Dr. Duke passed away in December 2017, but his garden lives on in tribute, lovingly tended by Helen and others. Having worked in the garden, first as a volunteer [since 2003] and then as director [since 2007], Helen is determined to keep the garden as close to its original intent and structure as possible, but she also has ideas and wishes for improvement and change. And she would like to groom a new director who is a good fit for the garden. She talks of keeping Dr. Duke’s legacy alive in the garden. I recall Smithsonian horticulturalist Janet Draper recounting the saying, “a garden dies with the gardener.” She didn’t mean the whole garden dies, but those parts of it that were unique to the gardener will necessarily change and evolve under new overview. But the Green Farmacy lives on, in a mostly dormant state heading into winter, with the hope of inevitable renewal in the spring. Helen tells us that Dr. Duke’s ashes were scattered in various places within the garden by devotees during a memorial service in June. A small alcove near the top of the garden includes some of his quotes, and a laminated photo of his smiling face framed by mullein flowers (Verbascum thapsus). Even as casual visitors, we could feel his spirit there—an energizing force. Betty Belanus is a curator and education specialist at the Center for Folklife and Cultural Heritage and a future master gardener. The veil of winter has finally lifted after its power struggle with spring forced a long endurance of raw cold, strong winds, rain, snow, and ice. Although the cacao plants (Theobroma cacao) in the greenhouse didn’t make it, hope springs eternal as the winter shabby Rosemary has come back to life with new flowers blooming – albeit after losing over 60% of growth from last fall. Rosemary is a hard one to keep alive during our Maryland winters. Jim is gone but seems to be everywhere in the garden. As I walk around, I hear his stories and teachings. He loved his rosemary. We spread Jim’s ashes a couple weeks ago in the garden just after what would have been his 89th birthday. We spread them under the rosemary, in the ayahuasca shamanic plot, by the ginseng, and wherever folks were moved to go. I have far too many stories of jim… and I’ve told this story far too many times of realizing a well-known botanist lived not far from my home. I learned of Jim back in my early 30’s after receiving a copy of a letter that he wrote to Seeds of Change in Arizona. I hesitantly called the phone number printed on his Herbal Vineyard Stationery and immediately reached Jim. He gave me his address on Murphy Road and told me to look for the driveway by the pine trees. For over two years, I shyly drove past this driveway before I had the nerve to turn in… which I finally did… only after I saw an open gallery sign as my chance not to feel too intrusive. Although the sign was for Peggy’s art gallery, she was not home, and I found Jim back working in his basement office. He kindly got up, left his desk, and with his genteel nature walked me around the square garden (which preceded the Green Farmacy Garden), offered me some mints and nettles, and then took me on a stroll into the woods. Afterward, in the basement where John’s office is now, he played a beautiful instrumental rendition of El Condor Pasa, “The Condor Happens” a Peruvian piece written for a musical in 1913. In the early 70’s, an English version El Condor Pasa (If I could) was made famous by Simon and Garfunkle. Jim encouraged me to go to Peru that day. As a young mother, I knew I would go, but I also knew it wouldn’t be for a long while. I finally went to Peru in 2003 with Jim and Holly, and while there, I heard many, many renditions of El Condor Pasa. And I certainly knew the last line pertained to Jim… I’d rather feel the earth beneath my feet, Yes I would. If I only could, I surely would. Yes, Jim would rather feel the earth beneath his feet, yes, he would. This barefoot doctor was firmly grounded – he was rooted, focused, and fixated on plants and music. I spent a lot of time in this garden with Jim. He had his favorite topics and plants. The yin/yang valley and the yin yang huo or the horny goat weed; the faba bean l-dopa and priapism; the evening primrose and alpha linolenic acid; sweet annie, artemisinin and malaria; his stinking rose garlic necklace, the spirit of the wintergreen; St. Johnswort and the FDA; dying his hippy beard yellow, nettles and the five or was it six neurotransmitters…acetylcholine, choline, histamine, leukotriene, and serotonin, and formic acid and occasionally he would say secretin, and I would wonder, “is that a neurotransmitter?”; he sang about how ginseng makes an older woman younger a younger woman hunger, an older man cocksure and an younger man endure; he talked about alcoholic hamsters and kudzu, and he taught about mayapple lemonade and genital warts. At the beginning of his tours, he also talked about a less known plant Angelica dahurica, “Bai Zhi” – this plant was in his garden to represent Don Quai or Angelica sinensis. He liked to tell students that the plant is in the Apiaceae or Carrot family along with edibles and spices – parsnip, dill, anise, parsley, fennel but also in the same family as poison and water hemlock. He taught that Angelica dahurica is a biennial as he dug up young roots to show how thick and fleshy they were (show roots). During its first year, the roots are edible and gathered energy from the sun and nutrients from the earth. He taught that the next year it bolted up 4 – 5 feet, put out thickly sheathed large parsley-like leaves, bore numerous flower inflorescences that attracted pollinators and how the flowers’s ovaries ripened to become seeds. Once the plants bolted he would tug at it gently and show how it easily came out from the earth (show dried stalk)…because at this point when the seeds were ripe that the roots, which had once been anchors, were basically non-existent. The next generation had been cast to the wind, seeded, and the adult plant no longer was necessary. I began to think of how Jim represented Angelica dahurica during the time I knew him -with the earth beneath his feet acting like roots gathering, compiling, working, teaching, so he could…yes he would… spread his wisdom, knowledge and spirit to so many and most importantly – to the next generation. At some point in the last decade, the neuropathy set in and he longer could feel the earth beneath his feet. It took some time for Jim’s anchor to let go, but he did so under his own will. He let go knowing that his seeds, his teachings, would be carried on, and so he sailed away like a swan that’s here and gone. All of us at the garden and his family will continue to maintain and realize his wish to do whatever is necessary to keep the garden a sanctuary to come, visit and learn – especially in bare feet. Yes we can, and we surely will. With sadness, we wish to inform readers of this Green Farmacy Garden blog site that Jim Duke peacefully passed in his home on December 10, 2017. He lived an amazing life filled with adventure, plants, people and music until his senectitude at age 88. 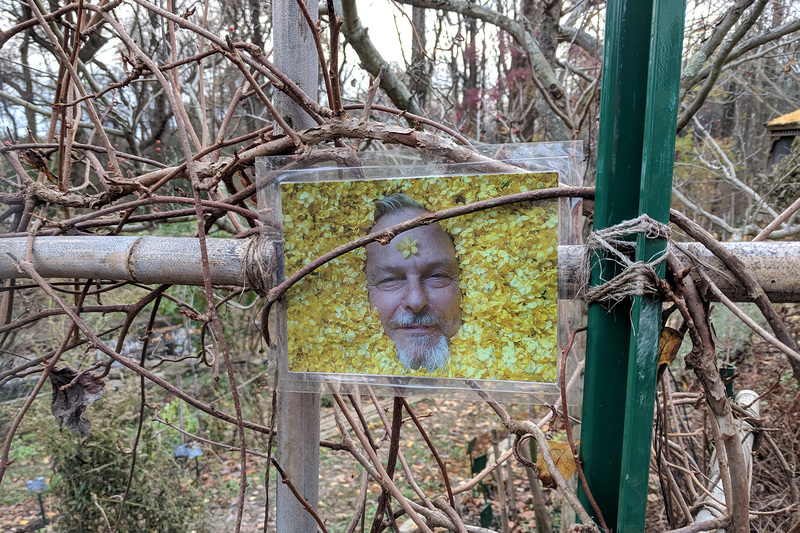 Jim’s desire was for his medicinal plant sanctuary to continue for as long as possible to educate and inspire students. We, at the Green Farmacy Garden, are committed to Jim’s vision and will maintain the garden for tours and workshops. Look for a list our tours and workshops in the spring. 3 April 2017 ~ Jim’s ethnobotany of spicebush below Helen’s observations. Traipsing through the lowland forest this past weekend and even on the cold dreary days of last week, it was impossible to miss hints lemon yellow glistening in the understory. Drawing nearer, it became detectable that the bright color standing out against the past winter’s worn out brown was from the small flowers of the spicebush shrub, Lindera benzoin. Spicebush is in the Lauraceae or Laurel family, which includes sassafras and avocado. 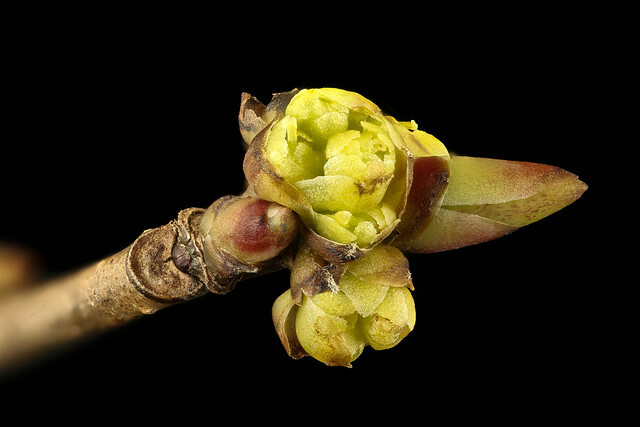 For those of you also in the outdoors this week and near a spicebush, focus in close and look into the flowers. Do you see pollen laden anthers of the male staminate flowers?… or do you see a roundish central pistil overshadowing small non-functional stamens in the female pistillate flowers? There are only male flowers on some bushes and only female flowers on other bushes. This type of division of the flower sexes with separate male plants and separate female plants is indication that spicebush is dioecious. Dioecious means “two houses” and is a term used mostly to apply to species with separate female and male plants. The males produce viable stamen with pollen for cross pollination of the female plants. I noted on my walks that the majority of the spicebush shrubs were bearing male flowers. According to John Eastman in the Book of Forest and Thicket (1992). “the female plants will be pollinated from “early solitary bees, ladybug beetles and by bee flies.” The female flowers will eventually drop, and if pollinated, the ripening ovaries will become lipid rich small red drupes appearing toward the end of summer. Wood thrushes and veeries enjoy the ripened fruit as do an occasional songbird. Spicebush flowers before the leaves emerge in late winter to early spring. Many folks who frequent the outdoors in the mid-Atlantic know this native plant even in a deer nibbled wood. Deer avoid munching on this plant most likely due to the aromatic scent just beneath the outer bark ~ making it unappetizing for these four-legged herbaceous beings. Often spicebush is the most prolific understory plant where deer are in high populations. The scent is one of nature’s defense mechanisms. No matter the season, scratch the bark and the spicy citrusy scent is very apparent. The scent is also apparent in the flowers bark and berries. “thanks to the work of Tucker and associates (1994), we know that the leaf essential oil is dominated by beta-caryophyllene (~ 15-50%), 6-methyl-5-hepten-2-one (~2-35%), and (E)-nerolidol (~10-12%). The twig essential oil is dominated by 1,8-cineole (~45%), sabine (~7%), alpha-terpineol (~ 7%), and alpha-pinene (~6%). Fruits are dominated by alpha-phellandrene (~65%). (Tucker, Maciarello, Burbage and Sturtz, 1994). Approaching retirement from the federal government, I am getting a bit more uninhibited about sounding off on one of my favorite themes, giving the herbal alternative a fair shake. Today, I’ll just talk about spicebush (Lindera benzoin), its culinary and folk medicinal uses, and its potential as a remedy for yeast (candidiasis), an ailment widely mentioned on TV today..
Spicebush is one of the commonest undershrubs in the forest around my place. And it has quite a bit of folklore about it. Still I don’t find reports on the chemicals which no doubt contribute to its aromatic, culinary, essential oil, medicinal, and pesticidal properties. We and the Asians have studied their species of Lindera while ignoring ours. And some American scientists, while busy studying alien species of Cocos, Cuphea, and Umbellularia as sources of lauric acid, ignore this copious resource in our back yards. I quote these directly so you, and the FDA, may see that they have served as tea and spice for years. That puts them in the category I abbreviate GRAF, generally recognized as food. In my Handbook of Northeastern Indian Medicinal Plants (Quarterman Publ., Licoln Mass. 1986), I mention that the Cherokee Indians used spicebush for blood disorders, cold, cough, croup, dysmenorrhea, hives, phthisis and swellings. Cherokee drank spicebush tea as a spring tonic, and steeped the bark with wild cherry and dogwood in corn whiskey to break out measles. Creek Indians used the teas for pains of rheumatism, (anodyne antirheumatic), for purifying the blood (depurative) and making themselves puke and sweat. (emetic and diaphoretic). Wisely they added willow to spicebush tea for drinking and using in the sweat lodges for rheumatism. The drug of choice today is still usually based on salicylates derived from willows. Ojibwa took the tea for anemia and that “tired rundown feeling”. Rappahannock used the tea for menstrual pain or delayed periods. To these Moerman (Medicinal Plants of Native America. Mus. Anthropol., Tech Rept. 19. 1986), in his more extensive survey adds that the Cherokee also took the tea for hives (sometimes associated with yeast, JAD). Iroquois used it for colds, fevers, gonorrhea, measles, and syphilis. Mohegans chewed the leaves or took the tea for worms. In their Peterson Field Guide to Medicinal Plants (Houghton Miflin, Boston. 1990), Foster and Duke add that the settlers used the berries as a substitute for allspice. It’s not bad! Medicinally the berries were used as a carminative for flatulence and colic. The oil from the fruits was applied to bruises and muscles or joints for chronic rheumatism. The tea made from the twigs was popular with the settlers (and available all year) for colds, colic, fevers, gas, and worms. The bark tea was used for various fevers, including typhoid, and to expel worms. In all that listing of applications, there’s not much folklore to anticipate that spicebush might be useful in yeast (candidiasis). But maybe the Indians didn’t have yeast. Apparently the yeast is a normal component of the flora of all human beings. Maybe cadidiasis is mostly an iatrogenic ailment, induced by our medicines. Respected naturopaths, Murray and Pizzorno (Encyclopedia of Natural Medicine, Prima Publishing, Rocklin CA. 1991) say that when antibiotic use first became widespread, it was noted immediately that yeast infections increased. White man’s alcohol, anti-ulcer drugs, corticosteroids, increase in diabetes, oral contraceptives, tights insead or cotton undergarments, and too much sugar in the diet all may have contributed to the emergence of candidiasis as a major ailment, today afflicting half our womenfolk. The total incidence and relative frequency of vaginal candidiasis have increased more than two-fold since the late 1960’s. There are a lot of synthetic alternatives for yeast, Nystatin, which is effective in mild cases. But Murray and Pizzorno suggest that garlic is more effective than Nystatin. I’d like to see the results of comparative heads-on trials between garlic, Nystatin and spicebush extracts. I’d like to see spicebush extracts compared also to Terazol, which reportedly leads to recovery of 95% of patients within three days. I’d like to see it compared with butacoconazole (Femstat), clotrimazole (Gyne-Lotrimin), ketoconazole (Nizoral) and miconazole (Monistat), all reportedly with an 80-90% cure rate. But the Graedons, after listing the latter four, reiterate the anecdote of the lady who had wasted $2,000 in office fees and medication, when a GP prescribed douching three times a day with 2 tablespoons vinegar in a quart of water (Graedons, 1991). That solved her $2,000 problem. Studying 54 plant species for antimicrobial effects, Heisey and Gorham (1992; Letts. Appl. Microbiol. 14: 136-9.) found that extract of stem bark of Lindera benzoin (“spicebush”) strongly inhibited yeast (Candida albicans), much better than any of the other 53 species. (Walnut husks also showed some activity.). Now if vinegar could have saved that lady $2,000, might not a vinegar extract of spicebush bark and garlic be even better. Spicebush is best of the 54 studied. Garlic is reportedly better than Nystatin. I suspect that our mixture might be as safe and efficacious as any of the drugs names above, but we’ll never known. You’ve seen the flurry of ads for expensive over-the-counter “remedies” for yeast. “See your doctor if you’re not sure. But if you’re sure you have yeast, use our brand.” Ten years ago, my doctor told me you couldn’t be sure without identification of the microorganisms involved. I doubt that has changed. Our FDA has become more relaxed in this regard. But if you started selling spicebush/garlic/vinegar for yeast, you’d be breaking the law, and the FDA might get you. But they won’t bother those OTC drugs because they have been proven safe and effective, to the FDA’s satisfaction, apparently. Are they more or less safe and efficacious than spicebush/garlic/vinegar? I don’t know. You don’t know. The FDA doesn’t know. The drug companies and physicians don’t know. I want the best medicine for myself and my family. But nobody is going to invest $231 million to prove that spicebush/garlic/vinegar is safe and efficacious for vaginal candidiasis. Hence we’ll never know. Unless somehow, we convince some influential congressperson that no new drug for candidiasis should be permitted unless it is compared, not only to placebo, but to the best herbal alternative (s) as well. If the herbal alternative works safely, the world should know if. More than two-thirds of the world’s population and nearly a third of Americans can no longer afford the high-tech synthetic options. And their cost is going up at a much higher rate than other segments of our economy. So fewer and fewer of us can afford the modern pharmaceutical. And there’s no governmental or private incentive to investigate the cheap herbal alternatives, that may be as safe and efficacious. Maybe its the time of year or maybe its the time of man….but it’s definitely the time to get back to the garden. As the last third of winter descends on the Green Farmacy Garden, we are back pruning woody plants and removing the last year’s annuals and perennials stubble of dead growth wearing t-shirts one day and bundled up in our thick coats the next. Climate confusion with a fluctuating roller coaster of hot and cold temperatures seems to have become the norm the past several years. The early warmth last week of temperatures close to 80 degrees summoned new growth and buds to swell only to be followed by a sudden dip back to the freezing 20’s and unfortunately nipping the tender growth. Plants such as the coltsfoot and butterbur emerge yearly as the earliest bloomers and push up their flower inflorescences prior to their leaves. Slippery elm, horny goat weed, Chinese coptis, vinca minor, Christmas rose, shepherds purse and bitter cress are also amongst our early flowering arrivals. It’s also the time of year that many folks still exhibit lingering coughs. Possible relief for respiratory irritations from two of our early bloomers comes to mind. Coltsfoot, Tussilago farfara, a member of the Aster family, with its sunny yellow flat topped ray flowers upon a scaly scape are easy to spot among the decaying leaves. Coltsfoot is indicated to reside in our asthma, bronchitis, cold and smoking plots – but currently is only in our asthma plot. The dried flowers and horseshoe shaped leaves are traditionally used for their mucilaginous, soothing, expectorant and antitussive qualities. While coltsfoot was used for centuries as a respiratory demulcent, there are now safety concerns with prolonged and large dose uses of this plant due to the pyrrolizidine alkaloids – specifically senkirkine -that are found in the plant. The pyrrolizidine alkaloids may have hepatotoxic (liver harming) properties, and for that reason, it is not recommended to take coltsfoot except for short periods of time and at low doses. Coltsfoot is taken as a tea of the dried flowers and leaves, but cautioned to use only in small doses and not by those who have a compromised liver, children, pregnant or nursing moms. While there may be a risk with taking coltsfoot as an expectorant, slippery elm poses no apparent safety issues. Slippery elm, Ulmus rubra, is harvested for its slimy or mucilaginous inner bark. At the Green Farmacy Garden, we harvested small diameter twigs last week to keep our tree from getting too tall; but to get the best medicine, harvest when the sap is running on larger diameter branches or trunks. Slippery elm, like American elm, is susceptible to Dutch Elm disease spread from a fungus and an elm bark beetle. Slippery elm is also on the United Plant Savers “at risk*” list. Sustainable harvest is essential for this native plant. Only harvest from plants that may be subjected to Dutch elm before the inner bark is affected or only take branches or parts of the bark of healthy trees without girdling the tree. Girdling kills the tree by cutting off the food and water routes of the plant and could invite Dutch elm disease. Cut off the corky outer bark to find the slimy inner cambium layer that readily peels off. Dried slippery elm bark can be chewed as is, or made into powder for a delicious nutritive porridge or a tea. We adapted the recipe at the Green Farmacy to use about a half cup of milk, water, or a milk substitute like almond, coconut or flax milk and a couple of tablespoons of slippery elm powdered bark, and spiced with cinnamon and honey to make thick delicious gruel. or… simply go to the store and buy slippery elm lozenges or a health food store to get powder. The medicine from slippery elm bark is not only used for inflamed sore throats and coughs, but also excellent to coat the gut for irritable bowel, and as a poultice for wounds and dry chapped skin. * The conservation of native medicinal at risk plants like slippery elm is of significant concern. It’s the time of year to please consider becoming a member of United Plant Savers during the March Membership Drive. Supporting United Plant Savers helps to ensure the renewal of native medicinal plants for future generations. Sanguinaria canadensis, bloodroot, blooming March 7, 2017 almost a month before it typically blooms.